The poet Aubrey de Vere was born in Curraghchase in 1814. He wrote poems about Irish patriotic events like "A Ballad of Sarsfield" and "The March to Kinsale". He was reared as a Protestant but in 1851 in Avignon, France he was received into the Roman Catholic Church. Aubrey had an audience with the Pope, who asked him to write a poem in honour of the Blessed Virgin. 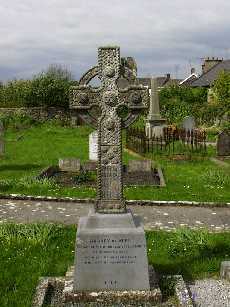 Aubrey de Vere died in 1902 and is buried in the graveyard besides the old St. Mary's church in Askeaton. The story of the Askeaton pilgrim was not uncovered until the end of the 18th century when Phil Rourke, a 90-year-old local of the parish told it to a local scholar. In Genoa, Italy in 1757 with the captain of a vessel that was owned by the merchant Don Martinez de Mendoza of Barcelona, Spain, had fallen in love with the only child of Don Martinez, Beatriz. He knew Don Martinez would never grant him permission to marry Beatriz so their love remained secret from her father. Don Martinez wanted his beautiful daughter to marry a member of the Spanish aristocracy but she refused his approved suitors. With the help of her uncle and her lady-in-waiting, Beatriz married her father's captain in secret. Her husband was soon sent back to sea and wished to be reunited with his wife. After spending the winter of 1757 in port, the captain was to lead the fleet to the West Indies. The young couple decided that on his return, they would tell Don Martinez of their marriage. The captain left for the West Indies without knowing that his wife was pregnant. Don Martinez now had to be told and he erupted in a fit of rage and refused to believe that the wedding had ever taken place, even when the priest who performed the ceremony told him of the truth. Don Martinez sent his daughter to a convent for bringing disgrace to his name. Don Martinez swore an oath that he would kill his captain. Don Martinez had men waiting at the port in Barcelona to kill his captain but friends of the captain rowed out to the vessel and told him of the trouble that awaited him at port and that his wife was in labour. By the time he got to the convent he was too late as his wife had died giving birth to their son. He hastily arranged the burial of his wife and the care of his son with the nuns and fled the city. With him he took the ebony ring that he had given his wife when he left for the West Indies. Don Martinez sold all his possessions in his rage and set off in search of his son-in-law. For ten years, he travelled throughout Europe in search of his captain, asking sailors for information on his whereabouts. In the winter of 1767, Don Martinez disembarked from a ship at Askeaton and lived in the ruins of the Desmond castle. Don Martinez did not tell anyone his name or his quest that brought him to Askeaton. After a month, he left Askeaton and resumed his mission. Somewhere in Ireland, he found his captain and murdered him and took his daughter's ebony ring. After these actions, Don Martinez fully realised what he had done and was distraught with grief and travelled throughout Ireland. He returned to Askeaton and arrived at the door of Phil Rourke, who was the local schoolmaster and parish clerk, in the middle of the night. Rourke was shocked by what appeared before him. Don Martinez was now a haggard old man with a grey beard. The following morning the stranger told Phil Rourke to take his purse of gold and remove what he needed to live a comfortable life. All the stranger wanted in return was to be provided with some bread and water for the reminder of his life. The stranger went to the friary and made a bed for himself. For the next sixteen years, Don Martinez devoted his life to prayer and meditation in forgiveness for his terrible sin. 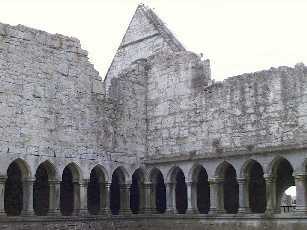 Each January the stranger left Askeaton and it was believed that he travelled the holy places of Ireland. On hearing this tale, Phil Rourke called him 'the pilgrim'. In January of 1784, the pilgrim was too sick to leave the friary and Rourke visited him in the friary to read from a prayer book. On the evening of January 17th, the pilgrim told his friend that he was close to death and gave a small book to Phil Rourke with the instruction to keep it until its owner would come to Askeaton. The stranger agreed to see a priest and Phil Rourke went for the priest. When they returned, the pilgrim was lying face down in the roofless chapel of the friary. Within a couple of minutes, the pilgrim was dead and was buried at the spot where he died. This however is not the end of the story. In the summer of the same year 1784, a boat sailed into Askeaton that was carrying soldiers. Phil Rourke saw the soldiers disembarking and three soldiers were heading in the direction of his cottage. Rourke ran into his home to avoid the soldiers but the soldiers had seen him. They banged on his door and Rourke, despite the danger, opened the door. At the door was a man in his twenties who bore an uncanny resemblance to the pilgrim that had died earlier that year. Rourke handed him the small book that he had been given and gave it to the soldier. Phil Rourke went to the friary with the soldiers and showed them the grave of the pilgrim, where they all knelt and pray for the soul. Phil discovered that the soldier was the grandson of the pilgrim, Don Martinez de Mendoza. Don Martinez had contacted the convent before his death to tell them of his terrible deed. The soldier read the notebook with the aid of a lamp. Then he ordered his men to the cloisters and ordered them to dig in certain places. They soon found a cask full of jewels but continued digging. One of the men removed one of the pillars and found a small oval box. Inside the box lay a miniature likeness of a woman and an ebony ring. Both of these belonged to the soldier's mother. The soldiers then left, taking with them what they had found and the two pillars that the soldiers had taken down during their search. The young man had left the notebook behind him. Phil Rourke picked up the book and left the friary. The following day the people of Askeaton were outraged by the damage at the friary. Phil Rourke decided not to tell anyone what he had seen until twenty years later, when, at the age of ninety, he told his story to a local scholar, who also got the notebook translated. This is when the full story became apparent. What happened in the end to the young soldier is unknown.